Our preview combines all of the free bets, money back specials and enhancements available for Royal Ascot. It will be updated daily as new offers become available so be sure to come back. It’s the greatest festival for flat racing and one of the most competitive horse racing events in the calendar. The finest horses will be flown in from around the world, and at this level, jockeys and trainers will be looking for the smallest of gains that will give them a narrow win. Being one of the most popular meets of the racing year, alongside Cheltenham, bookmakers have plenty of offers to boost business. There are two sections to this article. 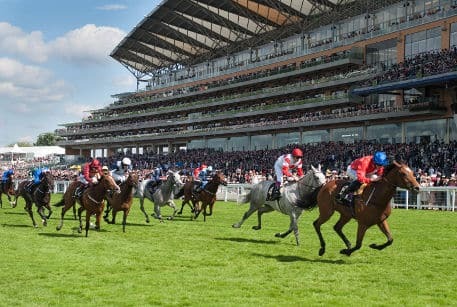 Here is just a selection of the best offers available for Royal Ascot. See the My Betting Sites homepage for the full list. Bet £10, and 10Bet will give you 3 x £10 free bets when you visit via My Betting Sites. Bet £10 and get £70 in free bets with Betfred when you visit via My Betting Sites. Terms and Conditions Register using the promo code WC18 and place £10 on the 2018 World Cup Outright market. Promotional period from 09:00 01/06/18 until 13:00 15/06/18. £10 Free Bet credited per game won in 90 mins by your outright selection, credited within 10 hours. Around half of the offers are known about in advance. The other half are announced on the day. Therefore we’ll continue to keep this section updated. Betway has an offer which lasts the entire week and applies to the first race each day. If your horse loses in the first race each day at Royal Ascot, then Betway will refund your losing stake up to £10. This will be paid as a free bet and applies to singles, and the win part of EW bets only. Paddy Power has a money back special for each day. Here is the one for Friday. Get money back as a free bet on all losing horses if Fairyland wins the 16.20 race. This is the money back special for Saturday. Get money back as a free bet on all losing horses if Crystal Ocean wins the 15.05 race. This offer is available for all races. Back a horse at this meeting, and if it doesn’t win, but does come 2nd or 3rd to the SP favourite, then Boylesports will refund your losing stake as a Free Bet. You must opt-in to receive this offer, and there is a max Free Bet of £20 available. Not quite as strong as the Boylesports offer as it’s limited to £10 and to 2nd place only but you can get money back if you don’t win your bet but the SP favourite does. This is similar to the William Hill offer below, but with a limit payout of £10. Back a horse to win in any race in the specified meet, and should your horse win by two or more lengths, Betfred will award you a free bet equal to your stake. This same offer is available via Totesport. This is available for all races. If your backed horse wins by 5 lengths or more, William Hill will give you a 15% free bet bonus on top of your winnings. So while the Betfred offer is 100% matches, it is only up to £10. If you’re betting bigger, this might be better as there is a larger £100 fre bet that can be awarded. Betfair has a very similar offer to Bet 365 above, in that if you back a horse to win, and it does win at Ascot, then Betfair will give you a free bet equal to your stake up to £25. This is available for all races at Ascot. The qualifying horse that wins must be priced at 3/1 or more. All six races are shown across ITV1 and ITV4. Coverage is split between the two channels to fit around the World Cup. There is also a daily ‘Opening Show’ on ITV4 at 9.30am. Royal Ascot can be streamed via the ITV Hub.